QNAP recently held a product launch event in San Jose. The main announcement was the follow-up to their TVS-871T released late last year. The first generation Thunderbolt NAS came with eight 3.5" drive slots, 16GB of RAM, two Thunderbolt 2 ports and two 10GBASE-T ports. Despite being priced at $2800 (Haswell Core i5 configuration) and $3200 (Haswell Core i7 configuration), QNAP noted that it was popular enough to expand the lineup with more models. The popularity stems from the fact that creative professionals dealing with multimedia content often deal with Thunderbolt DAS units for fast access to data. However, those DAS units are typically not amenable to shared workflows. 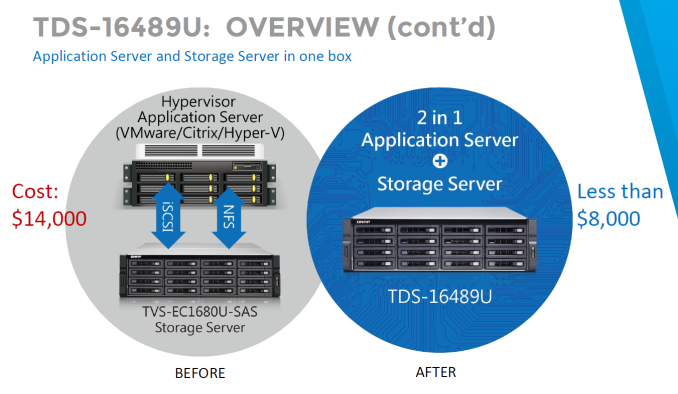 This is where a NAS / DAS combination like the TVS-871T has been able to make an impact. Thunderbolt networking support means that multiple PCs can access the NAS / DAS at high speed, while the network links can be used by other non-performance sensitive clients to access the data. The new TVS-x82T series comes in three different varieties, the TVS-682T, TVS-882T and TVS-1282T. They have 4, 6 and 8 3.5" drive bays respectively. The 4- and 6-bay units have two additional 2.5" drive slots, while the 8-bay unit has four additional 2.5" drive slots. The 6- and 8-bay units have LCD screens in the front panel. As the slide below shows, the models come with three HDMI ports (2x HDMI 1.4 + 1x HDMI 2.0), and have two M.2 SSD slots on the motherboard. The TVS-1282T also has a spare PCIe 3.0 x8 slot that can be used to add a 10 GbE / 40 GbE card or NVMe SSD or a USB 3.1 Gen 2 card or even a discrete GPU (that can be used as a passthrough device for a VM running on the TVS-1282T). QNAP was also heavily promoting their Qtier automatic data tiering technology which helps in improving performance while also enabling archive functionality within the same NAS by using another storage pool. Thunderbolt expansion units (5-bay and 8-bay) are also available. More information on the TVS-x82T models can be found on QNAP's product page here. It is interesting to note that the Thunderbolt ports are v2 and enabled by an add-on card. One of our chief complaints is the usage of Thunderbolt 2 instead of Thunderbolt 3 (which can also act as a USB 3.1 Gen 2 host / client as needed). QNAP mentioned that Thunderbolt 3 add-on cards are definitely in the pipeline, but, most current Thunderbolt users are in the Apple ecosystem. Thunderbolt 2 is the best technology currently available in those setups, and QNAP is pitching the TVS-x82T to that market currently. QNAP also had live demonstrations of the TDS-16489U (for hyperconvergence with a 2P Xeon platform that enables the application server and storage server to be one unit) and the ES1640dc dual-controller ZFS NAS. We have already looked at both these products in detail as part of our 2016 CES coverage. 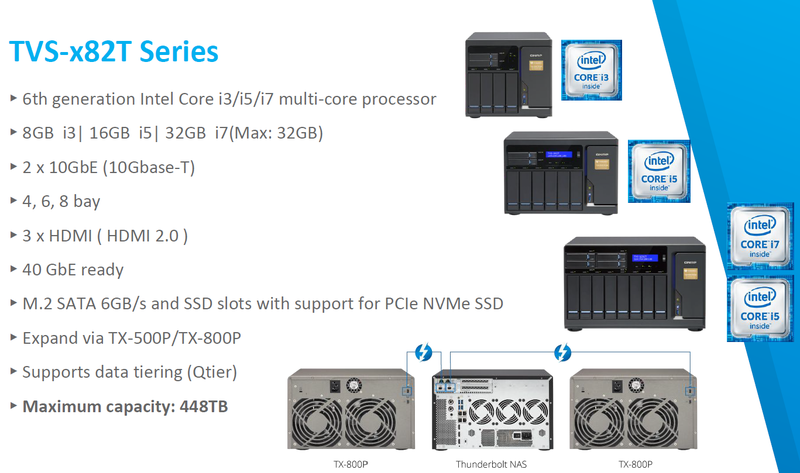 The new information presented at the San Jose event included availability details (mid-June for all products) and pricing for the enterprise NAS units (starting at $7700 for the TDS-16489U and $9700 for the ES1640dc). One of the striking slides that we saw as part of the ES1640dc presentation was the competitor landscape / target market for the unit. 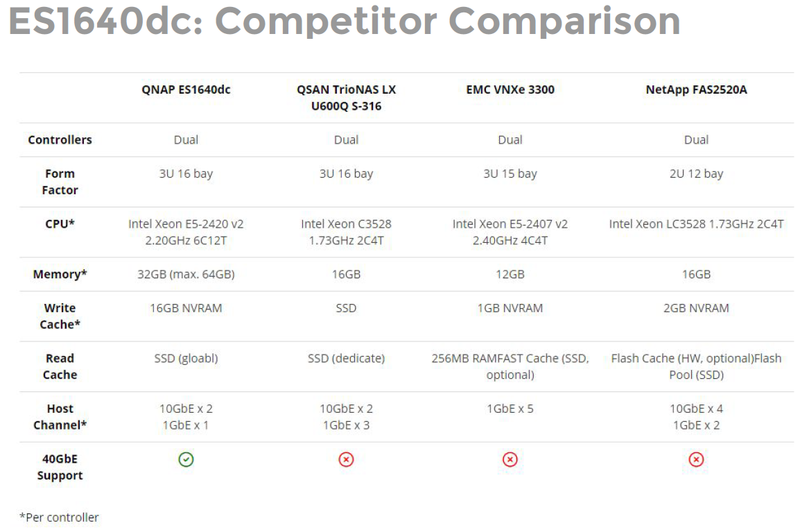 It is great to see QNAP move up to the next level and compete with the big guys such as QSAN, EMC and NetApp in the enterprise space. As the above slide shows, the hardware configuration is very good compared to the competition and I am pretty sure the pricing is more than competitive. However, in the enterprise space, the main challenge is support requirements. Enterprise customers require service contracts that keep any hardware-related downtime to the absolute possible minimum, and the software needs to be stable and production-ready. Quality Assurance steps also need to be more stringent compared to the typical requirements in the SMB market that QNAP has been serving so far. I will be closely tracking how QNAP's aspirations in the enterprise space pan out in the long run. 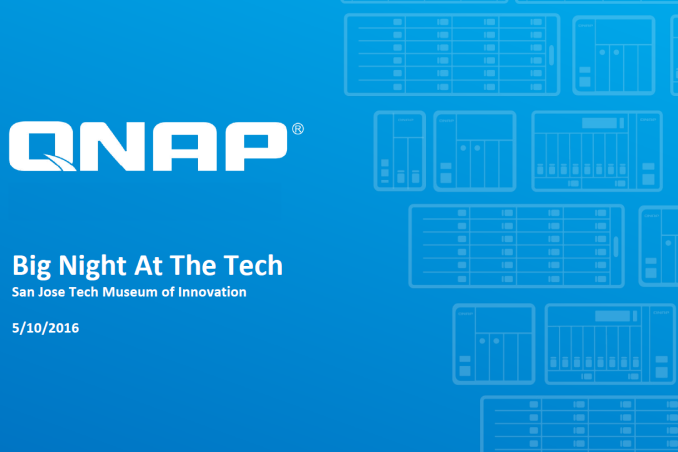 In other news, QNAP also launched the TS-831X, an ARM-based NAS with the Annapurna Labs AL314 SoC. It comes with dual 10G SFP+ ports. If that sounds familiar, the configuration is similar to the Synology DS2015xs that we reviewed last year. While the DS2015xs uses the 1.7 GHz AL-514, the TS-831X uses the 1.4 GHz AL-314 SoC. Both of them use a quad-core Cortex-A15 as the host CPU. QNAP's MSRP for the TS-831X will be $799, a lot lower than the current street price of $1400 for the Synology DS2015xs. These are total Beasts! I really wish QNAP would just sell their NAS OS as a standalone item. I dont wanna do ZFS because it mostly requires ECC RAM, and intel has made damn sure we can't use the latest and greatest cores in NAS's like this.
" because it mostly requires ECC RAM"
Does FreeNas Do VM's? 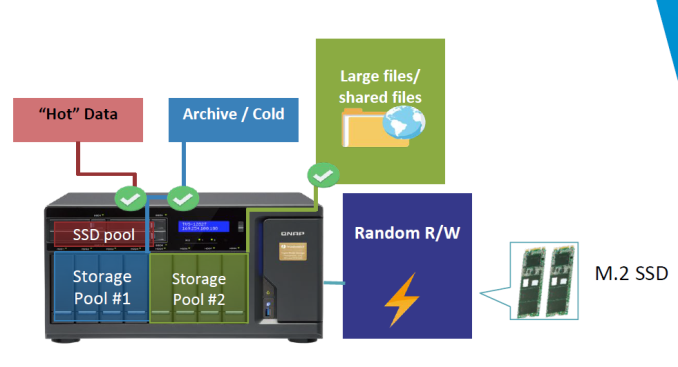 thats a huge feature that QNAP has over everyone else. Thats why i want them to just sell the OS. The hardware is to expensive. The reason why FreeNAStards spout the "ECC is required!" nonsense is because if you care enough about your data to have a dedicated machine for it that constantly verifies file integrity, then ECC is naturally along the same vein, and in cases where you're buying all-new-hardware, it isn't a much larger investment than non-ECC compatible hardware. The problem is, many enthusiasts want to repurpose old gaming machines as they upgrade to a modern one, using the old consumer-oriented (and therefore not-ECC-compatible) platform they already own. It'd cost them $0 to use existing hardware, and it'd cost a hefty sum (hundreds of dollars) to move to an equivalent ECC-compatible system. FreeNAS does Virtualbox VMs....so yes. I find the hardware from QNAP also unbeatable, I initially also wanted to build a FreeNAS or OMV NAS but I came to the conclusion that the hardware which was available was inferior. A suitable motherboard with 4x 1Gb LAN ports and a suitable PSU came out about as expensive as these NASs and still wasn't as good. Drinking the Kool-Aid it seems. "A suitable motherboard with 4x 1Gb LAN ports and a suitable PSU came out about as expensive as these NASs and still wasn't as good." a 4x 1GB Land Card is $50. And thunderbolt is on just about any Skylake Motherboard even the sub $130 ones. regarding the Power Supply's, thats a old argument that no longer holds true. There are so many cheap good PSU's in these small form factors. "Also, one can buy the non-Thunderbolt QNAP NAS with a Pentium chip for much less....one can upgrade the CPU and Thunderbolt card later." "Althought freenas does not require ECC, your running a huge risk due to the nature of ZFS. There are plenty of discussions on this topic, and the general consensus is, dont bother unless you use ECC." Can you explain to me what part of the nature of ZFS makes running non-ECC RAM a risk? The discussions on this topic typically center around a so-called "scrub of death". And as presented it doesn't make very much sense. 1) Having a stuck bit in RAM doesn't force every block of the filesystem to be pushed through that particular byte of memory space. So the typical way this "scrub of death" is presented as ZFS gleefully overwriting all of the filesystem one block at a time is at least a misunderstanding of memory management.